Mention “Amish transportation” and the horse-and-carriage immediately comes to mind. Yet most Amish also travel by a variety of other means, including car, train, bus, and by water. All Amish households have at least one, and sometimes numerous carriages, except for in some cases the elderly who may live near or in small towns in Amish communities. The buggy is important to Amish life as it serves as both a symbolic and literal brake on the pace of life. It also symbolizes Amish identity, serving an important cultural role. Use of the buggy is a key indicator of Old Order Amish status. Amish rely on the horse-and-buggy to travel short distances, such as to town, to visit family and neighbors, or to travel to church on Sundays. Buggies typically travel at about 5-10 miles per hour, and have a range of 15-20 miles before horses need to be rested. Amish only rarely ride horseback. Amish universally object to both automobile ownership, and to operating a vehicle, but in most cases permit riding in cars as passengers. Amish acknowledge a need to sometimes travel further than a buggy allows, thus the allowance for automobile travel. Amish may be driven by friends, non-Amish employees, and in some cases unbaptized or non-Amish children and relatives. Amish also frequently make use of the so-called “Amish taxi” services provided by non-Amish individuals in most Amish areas. Bus travel is another form of transport common among Amish. Read more on the Amish, buggies, and cars. 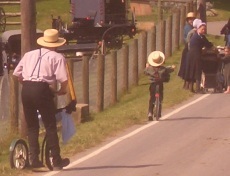 Bicycle is a popular form of travel, especially among Amish in the Midwest. Some communities are more bike-friendly, for example Arthur Illinois, with its asphalt roads and flat landscape. Holmes County, Ohio features the Holmes County Trail, a byway traversing the county and designed for both bike, buggy, and foot travel. Other communities rely on the scooter, such as the Lancaster County community, or that of Allen County, Indiana. Most church districts in Lancaster do not permit the bicycle. Rollerblades have been widely accepted in some communities such as Lancaster County. They are mainly used by youth and children, as a means of recreation as well as to travel short distances. Not all Amish permit rollerblades. More on the Amish and rollerblades. An exception to the allowance for car travel is found with the conservative Swartzentruber Amish group, who only allow automobile travel in an emergency. When visting relatives in distant settlements, Swartzentruber Amish must travel by bus or train. This limitation also prevents Swartzentruber businesses such as carpenters from working outside of horse-and-buggy range. Amish travel by train on occasion. In some cases Amish journey far distances by train, for example to Mexico or Canada for less expensive medical treatment, or to visit relatives and Amish in other settlements. Amish may spend three days on a train during longer journeys. Other Amish, such as those in Pennsylvania and the northeast, may make use of regional rail networks for shorter trips. Amish nearly universally forbid travel by air. Flying is seen as worldly, symbolic of luxury, and unnecessary. Most Amish do permit air travel in emergencies, such as lifeflights to medical centers. Most New Order Amish, representing a small segment of Amish society, permit travel by plane for business or other purposes, however. More on the Amish and air travel. Amish forefathers originally arrived in North America in the 1700s by ship. Today Amish do not prohibit travel by water. Travel by water is most often a form of recreation for Amish. Amish occasionally may travel by ship to visit Europe. Some Amish, such as those in Lancaster County, may take recreational deep-sea fishing trips. Also, numerous Amish in communities such as northern Indiana own small fishing boats, and may be spotted on lakes or towing boats by buggy. Amish value the horse-and-buggy for what it represents, and for the tangible effect it has on their way of living. At the same time, they recognize a need for other forms of transportation, and most Amish Ordnungs permit travel by numerous means, including by automobile, train, and boat. 9 responses to How do Amish travel? is there a minimum age for an amish person to legally drive a buggy on the road in PA.? Also, must they submit to any type of license or exam and tmust the buggy submit to any type of inspection ? The laws of driving in the states are mostly motor vehicle related. When a farm tractor or other equipment is on any public road it is exempted as well as any horse drawn vehicles. Therefore the drivers need not to be licensed. The buggies are not motor vehicles either so do not need inspection. Another question was do the horse need to be tested for emissions. Could you see a horse with a catalytic converter attached??!!! That would take the cake! Perhaps if a politician is walking on the road they also should have emissions testing and a catalytic converter as well. They certainly have lots of carbon dioxide emissions and it is all hot air!!!!!!!!!!!!!! Great questions! The ones I know do not have licenses, and the young (but responsible ) school-aged children do drive on the community roads (they are KY state maintained, but not busy highways -they are residential w/ little traffic). I’ve never seen a youngster driving on the highway. Bill if you have to have it then you have to have it. My advice is to check with the family beforehand–some Amish don’t have an issue with allowing their photos to be taken for these purposes (ID’s, etc). I don’t know what kind of trip this is but I am guessing that if this is any sort of “vacation” trip (ie overseas to Europe) the family probably won’t be that surprised if at all, and may very well accept it, because they’re probably not from the most conservative segment of Amish society. I am on a train and there are some amish people on here. I thought they were performing in a play or somthing but my mum told me they probably weren’t. And I’ve been searching up amish people the whole ride. My mum says it would be easyer for me to just asked them. But they left on our last stop so now I can’t. I wasn’t going to anyway. I am a traveling sales man and cover 75% of the US via car or plane. ( Not the NE corridor ) I have driven over 2million miles, drove a commercial truck/ bus and was a commercial limousine driver for 2 years. I live in Wis. but I could offer my service for any customer south of Wi. i.e. Iowa. Please contact me if you have any interest in my services- A resume of my past travel experience and references is available upon request. Someone clicked to confirm they are not a spammer and yet spammed anyway. I know, it seems like a very time-consuming way to spam, doesn’t it? 🙂 Deleted. Leave a reply to How do Amish travel?